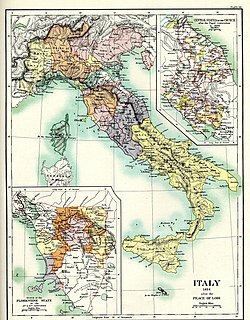 In the first half of the 15th century, the larger Italian powers had been consolidating their territories, with Savoy expanding towards the Ligurian coast, Venice focussing on Teraferma whilst the Stato da Màr were threatened by Turkish expansion, Milan expanding southwards (and, even after the dismembering of the empire after Gian Galeazzo Visconti's death, retaining the bulk of Lombardy), the Florentines having gained most of Tuscany and the Papal States having begun the unification of the Pontifical territories that would continue over the next two centuries, while Alfonso V, king of Aragon, acquired both Sicilies, reigning the Kingdom of Naples as Alfonso I, as well as expanding to the north. Solemnly proclaimed on the 2 March 1455 with the accession of Pope Nicholas V (1447–55), king Alfonso and other small states to the League (excluding Malatestine Rimini, at Alfonso's insistence), by it was established a mutual defence agreement and a 25-year truce between the Italian powers, forbidding separate alliances and treaties while committing to maintenance of the established boundaries. 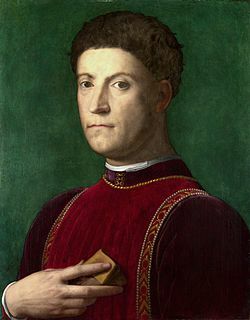 After the period of confrontation, the Italian states acknowledged the condottiero Francesco Sforza as successor to the last of the Visconti in Milan, after having married the only daughter of Filippo Maria Visconti. The relative peace and stability resulting from Lodi and the League, promoted by Sforza, allowed him to consolidate his rule over Milan and it was Cosimo de' Medici's most important foreign policy decision to end the traditional rivalry between his Florence and Sforza's Milan. The League was the coherent development of the Peace of Lodi, born from the realisation that none of the regional Italian states, despite the long and bloody wars in the preceding hundred years, was in a position to assume hegemony in the north, let alone the entire peninsula. The League therefore provided a détente, founded on mutual suspicion and fear of France rather than on collaboration, which might have led to the formation of a broader, unified state. The Italic League played an essential part in the balance of power subsequently pursued by the Florentine ruler Lorenzo de' Medici (1449–92); its only cracks were the Pazzi conspiracy, the Barons Conspiracy and the Salt War. The League provided enough stability to allow the peninsular economy to recover from the population loss and economic depression caused by the Black Death and its aftermath, leading to an economic expansion that endured until the first part of the 17th century. The League also enabled the creation of the first permanent embassies amongst the states of the Italian peninsula, in order to monitor compliance with the terms prohibiting supporting exiled dissidents, with De Officio Legati — what seems to be the first treatise on ambassadorship — written by Ermolao Barbaro in Venice in 1490, after he had served the Serenìsima in Burgundy and Milan. With the death of Lorenzo de' Medici in 1492 was marked the decline of the League, he having been one of its greatest supporters and prime maintainer, recognising the advantage of maintaining a balance among the five powers as opposed to trying to eliminate his enemies. Whilst the League failed to prevent the French invasion in 1494 that began the Italian Wars[clarification needed], it did enable (as the League of Venice) the creation of the army that repelled Charles VIII's army after their sack of Naples. The League army engaged the French at Fornovo and retained control of the battlefield but failed to prevent an orderly French retreat. The Venetian alliance with France and Spain against Milan and Naples in the Italian War of 1499–1504, however, sounded the death knell for the League. 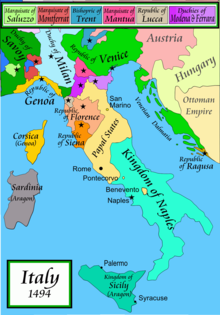 As a result of the détente, unlike France, Spain and England, Italy failed to coalesce into a nation state in the Middle Ages, and was ripe for conquest by the major European powers. Several factors have been considered causes of this; Francesco Guicciardini blamed particularism, for example, while Niccolò Machiavelli believed it resulted from the moral and civil decay of institutions and morals and in Papal policy, for centuries aimed at avoiding the formation of a unitary Italy. It should be borne in mind, however, that Machiavelli's great work The Prince was a reflection of the political equilibrium resulting from the League's existence. ^ a b c d Roland Sarti (2004). "Italic League". Italy. Infobase Publishing. p. 342. ISBN 978-0816-07474-7. ^ a b Randolph Starn (1982). Contrary Commonwealth: The Theme of Exile in Medieval and Renaissance Italy. University of California Press. pp. 86–90. ISBN 978-0520-04615-3. ^ Clifford Rogers (2010). The Oxford Encyclopedia of Medieval Warfare and Military Technology. Oxford University Press. p. 558. ISBN 978-0195-33403-6. ^ Roland Sarti (2004). "Sforza, Francesco (1401–1466)". Italy. Infobase Publishing. p. 558. ISBN 978-0816-07474-7. ^ Roland Sarti (2004). "de' Medici, Cosimo (1389–1464)". Italy. Infobase Publishing. p. 401. ISBN 978-0816-07474-7. ^ a b Randolph Starn (1982). Contrary Commonwealth: The Theme of Exile in Medieval and Renaissance Italy. University of California Press. p. 93. ISBN 978-0520-04615-3. ^ Edward Muir (1998). Mad Blood Stirring: Vendetta in Renaissance Italy. JHU Press. p. 35. ISBN 978-0801-85849-9. ^ Giancarlo Colombo (2007). Who's Who in Italy, Volume 2. Who's Who in Italy SRL. ISBN 978-8885-24662-1. The death of Lorenzo (1492) marked not only the end of Florentine power but also that of the Italic League, of which he had been one of the supporters. ^ Robert Lopez (1970). The three ages of the Italian Renaissance. University Press of Virginia. p. 36. ISBN 978-0813-90270-8. Not Charles, who died three years later, but Louis XII, his successor, crossed the Alps again in 1499; and his first victim was the duke of Milan. The revengeful Venetians joined the French in the kill; the Italic League was gone beyond recall. ^ Sebastian de Grazia (1989). Machiavelli in hell. Princeton University Press. p. 152. ISBN 978-0691-05538-1. Lorenzo de' Medici was an Italian statesman, de facto ruler of the Florentine Republic and the most powerful and enthusiastic patron of Renaissance culture in Italy. Also known as Lorenzo the Magnificent by contemporary Florentines, he was a magnate, diplomat, politician and patron of scholars, artists and poets. As a patron, he is best known for his sponsorship of artists such as Botticelli and Michelangelo. He held the balance of power within the Italic League, an alliance of states that stabilized political conditions on the Italian peninsula for decades, and his life coincided with the mature phase of the Italian Renaissance and the Golden Age of Florence. The Peace of Lodi of 1454 that he helped maintain among the various Italian states collapsed with his death. He is buried in the Medici Chapel in Florence. The House of Sforza was a ruling family of Renaissance Italy, based in Milan. They acquired the Duchy of Milan from the previously-ruling Visconti family in the mid-15th century, and lost it to the Spanish Habsburgs about a century later. Cosimo di Giovanni de' Medici, called "the Elder" and posthumously "Father of the Fatherland", was an Italian banker and politician, the first member of the Medici political dynasty that served as de facto rulers of Florence during much of the Italian Renaissance. Despite his influence, his power was not absolute; Florence's legislative councils at times resisted his proposals throughout his life, and he was always viewed as primus inter pares rather than an autocrat. His power derived from his wealth as a banker, and he was a great patron of learning, the arts and architecture. Piero di Lorenzo de' Medici, called Piero the Unfortunate, was the gran maestro of Florence from 1492 until his exile in 1494. Lorenzo di Piero de' Medici was the ruler of Florence from 1516 until his death in 1519. He was also Duke of Urbino during the same period. His daughter Catherine de' Medici became Queen Consort of France, while his illegitimate son, Alessandro de' Medici, became the first Duke of Florence. Piero di Cosimo de' Medici , was the de facto ruler of Florence from 1464 to 1469, during the Italian Renaissance. Galeazzo Maria Sforza was the fifth Duke of Milan from 1466 until his death. He was famous for being lustful, cruel and tyrannical. Caterina Sforza was an Italian noblewoman and Countess of Forlì and Lady of Imola firstly with her husband Girolamo Riario, and after his death as a regent of her son Ottaviano. 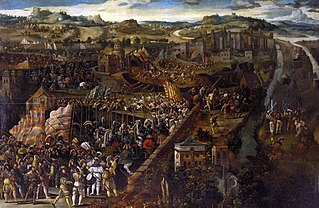 The First Italian War, sometimes referred to as the Italian War of 1494 or Charles VIII's Italian War, was the opening phase of the Italian Wars. The war pitted Charles VIII of France, who had initial Milanese aid, against the Holy Roman Empire, Spain, and an alliance of Italian powers led by Pope Alexander VI. This timeline lists important events relevant to the life of the Italian diplomat, writer and political philosopher Niccolò di Bernardo dei Machiavelli (1469–1527).